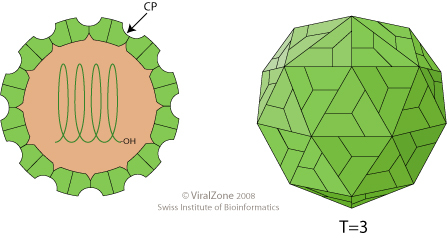 Non-enveloped, spherical virion about 34 nm in diameter with T=3 icosahedral symmetry composed of 180 CP proteins that make bumps at the surface of the virion. Monopartite, linear, ssRNA(+) genome of 4.4 kb with a stem loop structure at the 3'-end. The virion RNA is infectious and serves as both the genome and viral messenger RNA. ORF1 encodes the replicase and ORF2 encodes the capsid protein. The viral RNA ORF1 and ORF2 are translated. ASSOCIATED DISEASES Controls the host population possibly through lysis of the host cell.